Their secret romance began with a blind date arranged by a mutual friend, said Hannah Furness in The Daily Telegraph. 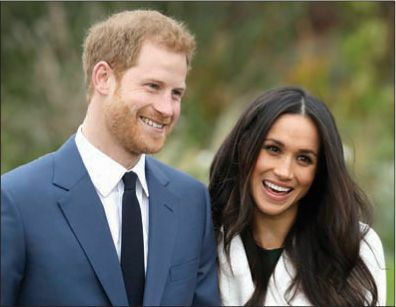 A whirlwind 16 months later, Prince Harry, 33, has announced he’s engaged to American actress Meghan Markle, 36, and Britain is celebrating. Markle, the glamorous star of the TV legal drama Suits, was filming in Toronto for most of the courtship, and the two flew to visit each other every two weeks. “I fell in love with Meghan so incredibly quickly,” Harry said. And so did the rest of the royals—including the queen’s corgis, who curled up at Markle’s feet when she met her future grandmother-in-law. The wedding, scheduled for next spring, is expected to be a grand affair and generate as much as $135 million in tourism and souvenir sales. “The last time a member of the British royal family proposed to an American divorcée, a full-blown constitutional crisis ensued,” said The Times in an editorial. So it’s a remarkable sign of progress that Markle has been warmly welcomed “into a family not known for its diversity.” Besides being foreign born and previously married—to Hollywood producer Trevor Engelson— Markle is biracial and was raised a Catholic. Her mother is an African-American social worker descended from slaves, her father a Hollywood lighting director of Dutch and Irish background. This marriage will change “Britain’s relationship with race forever,” said Afua Hirsch in The Guardian. Markle has expressed pride in her black heritage and talked openly about seeing her mother—Harry’s future mother-in-law—abused with the N-word. Growing up mixed-race in the U.K., I always thought that the Britishness represented by the royal family “was one that excluded me.” Not anymore.